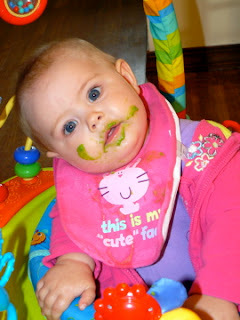 A few weeks ago, our lil one turned 6 months old and we decided to start solids. 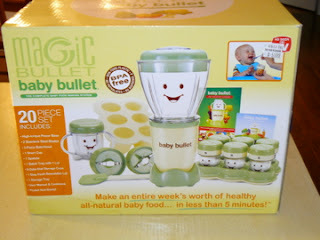 Which meant it was time to pull out my Magic Baby Bullet, one of my absolute favorite baby shower gifts! It's a complete set of all you need to make everything on the menu for your bundle of joy. 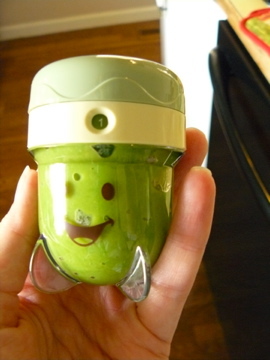 I love the idea of making baby food instead of buying jar after jar of the processed stuff. Not only do I know exactly what goes into my baby's food, but I can control the quality of the food as well. We buy all our produce from either local farmer's markets or a small grocery store that is stocked full of local goods. It's great for our bodies and for our local economy. 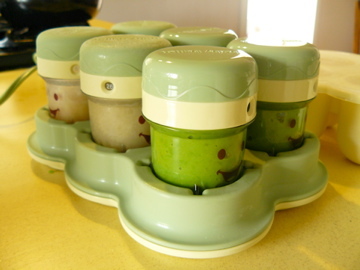 Happily, making my baby's food is both delicious and super easy. I know the thought may sound daunting, but it's so quick and saves a ton of money. I started with apples. It took literally one apple and 15 minutes start to finish to make food for the entire week. We've moved on since then to avocados and bananas and pears, and now it's time for peas. I thought I'd take you through the process. Right now it's ridiculously easy since she is only supposed to take one single food over the course of several days to make sure she doesn't have adverse reactions. So on Sundays, I pick the food of the week and get to work. 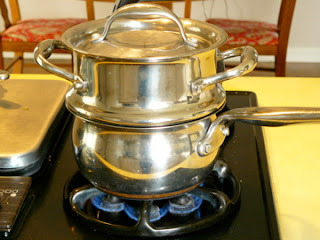 I use this pot that has an perforated insert for steaming. I don't boil the food since that can alter the flavor and nutrition. It's entirely up to you though and depends on what tools you have to work with. This is a heaping cup full of frozen peas (I would have preferred fresh, but couldn't find any this time of year). With water boiling in the pot below, I simply cover this and let it steam for 5-10 minutes or until tender. 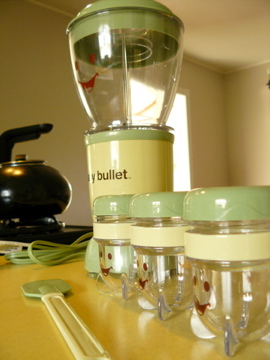 The Bullet blender comes with two different size batch cups for blending depending on the size of your batch. I've been using the large one for everything so far even if the batch is small enough for the smaller size cup. Whatevs. 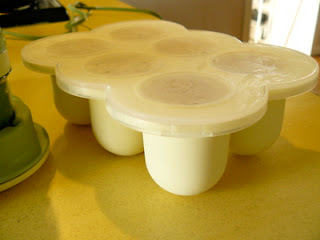 I pulled out only 3 of the serving cups since I planned on making this batch chunkier. 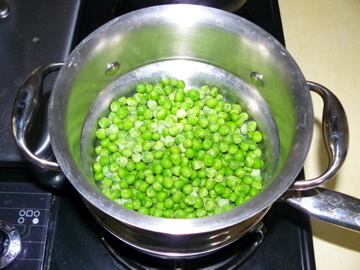 If I planned on using more liquid to thin the peas out more I'd likely need more serving cups. I made sure my blending blade was on (it comes with a milling blade as well to process grains into a powder) and was good to go. Each of the serving cups has an ingenious rotating ring around the rim that can be adjusted to the date you make the food. This is excellent! I just find the current date, in this case 1 for May 1st, and when I put it in the fridge or freezer I know exactly when it's past it's time. Freezer storage lasts for an average of 3 months and fridge storage lasts 3 days. No muss, no fuss and no pen marks to scrub off. 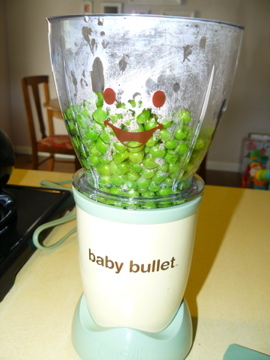 After about 5 minutes (semi frozen peas don't take any time to steam), I poured my peas into my Bullet and added just a splash of the cooking fluid. You can also use breast milk or formula of you prefer. The more fluid you add the thinner the mixture will be. We started out really thin with the applesauce and have gradually made it thicker as we progressed with foods. I ended up with this yummy pea goop. To get a more chunky texture, it recommends pulsing the blender instead of letting it go. I pulsed several times, adding a splash of cooking fluid here and there until I reached what I was aiming for. It took about 3 minutes. 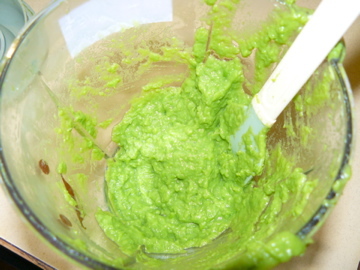 In my experience thus far, adding a 1/2 cup of fluid and letting it go takes about 30 seconds for a thin puree. I took more time and care to achieve a certain level of texture for her to try this time around. I filled my serving cups up. I filled them all the way full this time since I only had a couple cups not being used with other foods at the moment. For babies just starting on solids, they usually only eat 1/4 to 1/2 of this size. I started out by only filling them halfway and using them as her bowl during feeding. I figure this time I'll just empty a tablespoon or so into a separate bowl so I don't contaminate the serving cup. That way these cups should last a few days at a time instead of one cup per feeding. 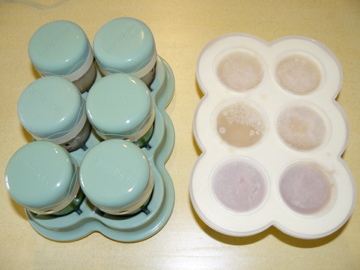 For freezer and fridge storage, the kit includes these handy lil guys. 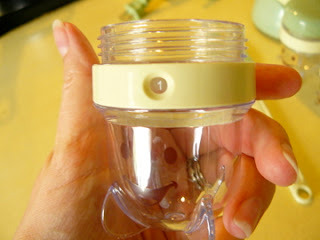 This is a no-tip cup holder for all the serving cups. They slip right in and stay put. Right now I have it in the freezer with various batch overflow, applesauce and bananas. I only have one or two cups in the fridge at a time. Two if they are half full, one if they are completely full like with the peas. Then I put the rest in the freezer and make sure I take one out the day before I intend on using it. That way you keep your food in rotation, so you don't have to worry about wasting it. This is a nifty freezer storage container for large batches. The sections are bigger and have helped with storing the food I made way too much of. It will be great when she's eating larger portions and more variety. I can store her favorites on standby all the time. She was digging the peas for sure! The texture was thicker than she has been accustomed to so far, but I think after a couple more feedings she'll have that down pat. For certain, I can say that I get an extra special warm fuzzy feeling when she's really enjoying the food I made for her myself. Not that there's anything wrong with buying pre-made food, but I do feel like I'm going the extra mile for her health and wellness by making it from scratch. As a first time mommy, I'm all about "only the best for my princess" and this is another way I feel I'm giving that to her. And why not?! In reality, it's way faster that driving to the store. It's leaps and bounds cheaper. It's super easy and super fun! And let's face it...everything tastes better when made from scratch!